The Juarez neighborhood, the area between Paseo de la Reforma and Avenida Chapultepec, is experiencing a significant rebirth. Wishing to position itself at par with Condesa, Roma or Polanco, it’s starting to propose new restaurants, bars, and cultural events in order to attract both locals and foreigners to this area of Mexico City. Among the restaurants that have opened on these streets, I recently visited Amaya, a venue highly awaited by the capital’s residents, for being a new project under the leadership of renowned Chef Jair Téllez. Chef Téllez is famous for his marvelous restaurants Merotoro in Mexico City and Laja in the Valley of Guadalupe, where he transforms Baja California cuisine into its greatest form. Both places have been among the Top 50 Latin America Restaurants by S. Pellegrino and Acqua Panna in recent years. Amaya uses the tasty food, rare wines slogan. That is why we could say this restaurant is a type of wine bar that offers unique wines and simple food, using the highest quality of ingredients. 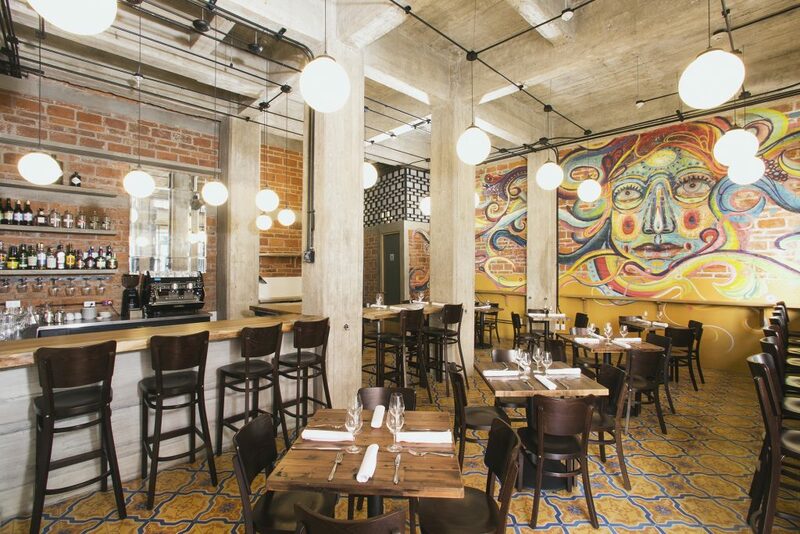 Upon stepping into the restaurant, the first thing that will grab your attention is the colorful graffiti created by artist Jorge Tellaeche, the image of a woman’s face painted on the front dining area’s brick wall. The rest of the décor is minimal, exposed concrete columns, a blue and yellow tile floor, and dark wood furniture. Right after I arrived at my table, the waiter brought an interesting menu of natural wines and kindly suggested Bichi La Santa 2015 (naked wine) from the Téllez and Luyt winery. Many will ask me what naked wine means. For those of us who are not experts on the subject, the clearest answer – without going into technicalities – is that these wines are created following natural processes, employing the least possible technical interventions. Color tends to be lighter and flavor is subtler than usual traditional wines. The food menu may vary according to season and available ingredients, much of these come from Baja California and Oaxaca. As the restaurant’s slogan states, food is tasty without being sophisticated. For an entrée I ordered a cebiche-style fried fish tostada, garnished with cabbage and avocado. Without being an innovative dish, the mix of flavors – including the fish’s freshness – will certainly make you ask for more. As the main dish I chose rustic roast lamb with wild mushrooms covered in raw spinach leaves. The extremely minimalist presentation of this dish delights guests from the moment it arrives, while the meat melts with each bite thanks to its long cooking time. Other dishes worth trying include the tomato salad with burrata; the beef tartar with sardines, capers mayonnaise and crunchy potatoes; the fried sea bass with salted potatoes and aioli; and the grilled white weakfish with lime, pine nuts and capers. A truly delicious variety of dishes! Amaya is the perfect restaurant to enjoy something different among friends, and enjoy good wine in the Juarez neighborhood. I suggest you make reservations and request the restaurant’s front tables, as the area next to the spectacular graffiti is much more pleasant and brighter than the rear.